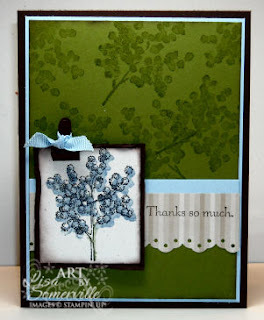 The original Make & Take for this card didn't have the Bashful Blue or Chocolate Chip panels. I also added the Torn Frame Technique around my image and sponged on the Chocolate Chip ink. Then moved my panels a little lower on the card. This next Make & Take was originally a Treat Pouch. I cut apart the Baja Breeze card stock, and created panels for a card. Adding the Chocolate Chip, Kiwi and Tangerine panels. When I cut apart the Baja Breeze pieces, I also added the Eyelet Border punch. 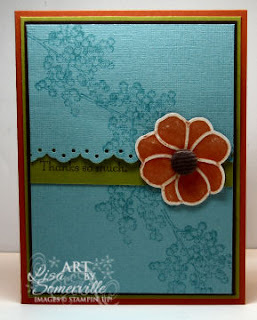 The Flower was created using the Simply Flower Embosslits Die and Tangerine Tango DSP. Simply sand your paper after it's embossed and the raised areas now become white. 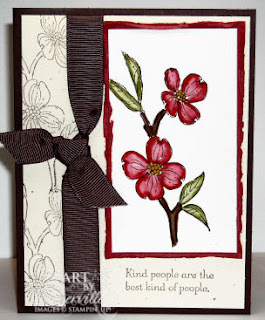 When remaking this card, I added the Chocolate Chip base panel, the Torn Frames around my image, and used the Marker Watercoloring Technique to add color to my flower image. Lisa - all three cards are gorgeous! Lisa, I love these cards! When I saw that they used Soft Summer, I thought you had done Next Day Air and then stamped VERY quickly and took pictures and updated your blog all within an hour or so! So I was relieved to see that you used the set at Regionals! I assume you ARE getting this stamp set?! I can't wait to get mine tomorrow!!! These are all great Lisa! I love the last one! Great job with the make overs! Great cards Lisa!! Your blog is beautiful!! !